Amazing savings prepared for you at carter's store locations in the U.S. Print the coupon and save 20% off your in-store purchase when you spend $40 or more. Or, save 15% off your entire in-store purchase. 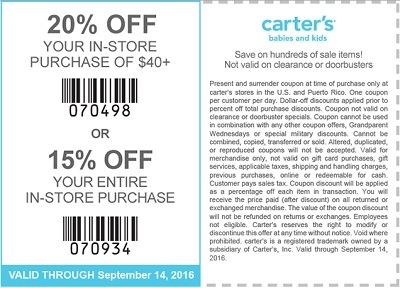 Get your coupon through carter's emailing. Source of the information is carter's. The offer is valid until September 14, 2016. For more details see any carter's store location in the U.S.
(total: 620)G.H. Bass & Co.